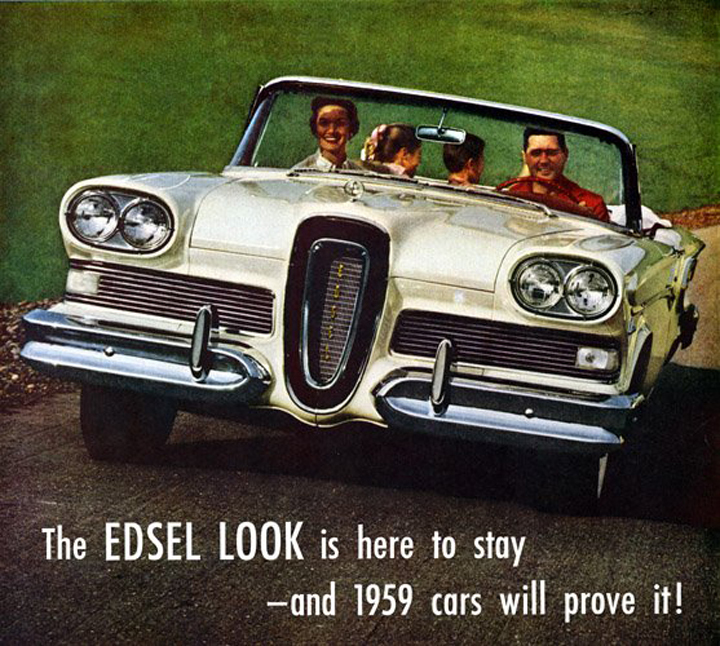 Though long synonymous with failure in many realms, the Edsel bombed only because it arrived just as a steep recession was killing the medium-price market it targeted. Unconventional styling didn’t help. There’s a triple irony in this mid-season ad from debut 1958. To wit: the “Edsel Look” was swiftly toned down for ’59, no other ’59 cars emulated it, and the brand itself was not “here to stay,” running only through an abbreviated 1960 model year. But Ford Motor Company had the last laugh, as the money it spent on plant expansion for Edsel was more than recovered when the new-for-1960 Falcon compact proved an instant runaway best-seller. Chrysler Corporation’s traditional “middle-middle” brand was another ultimate casualty of the ’58 recession, though DeSoto hung on a year longer than Edsel, winding down after a token run of 1961 models. 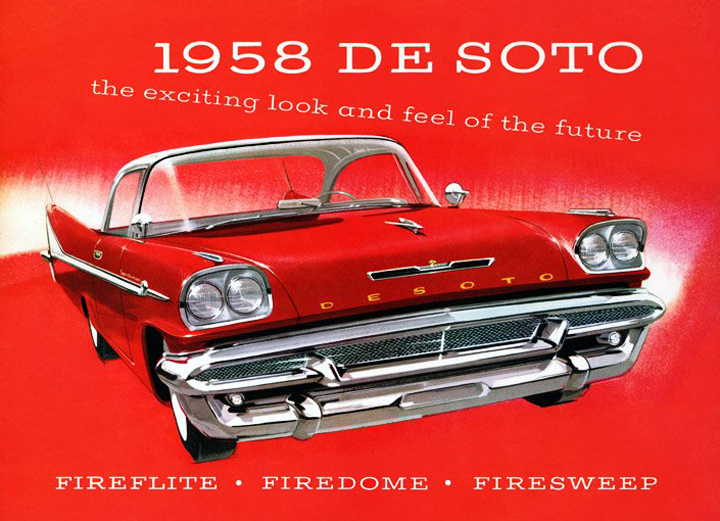 The above brochure cover emphasizes the ’58 DeSotos’ restyled front end, likely because it was one of the most obvious changes from the all-new ’57s. Though a 1962 DeSoto was on the corporate agenda as late as 1959, Chrysler finally decided that the brand had outlived its usefulness and covered its price territory with cheaper Chryslers and more-deluxe Dodges. The Corvair was the least orthodox of the Big Three’s new 1960 economy compacts and was always the least popular. 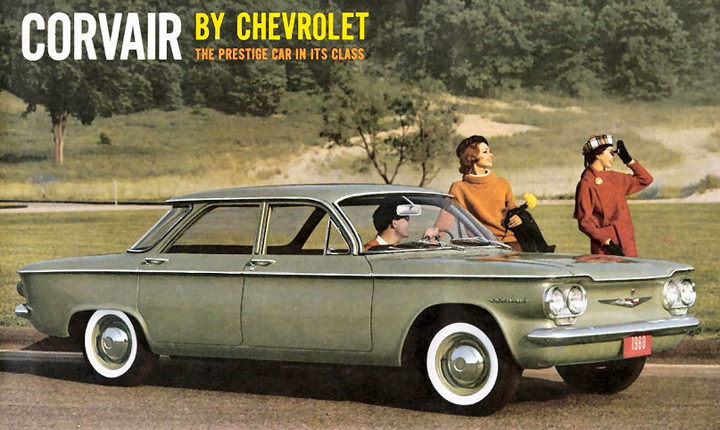 But the ad agency couldn’t know that when it prepared this introductory brochure, which proclaims that the first rear-engine Chevy is “the prestige car in its class.” Actually, Corvair’s European-inspired engineering was rather prestigious versus the anvil simplicity of the rival Ford Falcon and Chrysler’s Valiant. 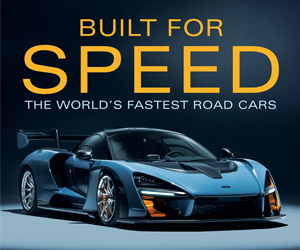 Trouble was, the inspiration was the humble Volkswagen Beetle, a design with well-known handling flaws that General Motors exacerbated by cutting corners with a copycat swing-axle rear suspension. Though Chevy ads gamely insisted that “the engine’s in the rear, where the engine belongs,” a young on-the-make attorney named Ralph Nader decided that Corvair was “unsafe at any speed.” The rest, as they say, is history. Looking back, the only reasons Corvair lasted as long as it did—10 model years—were belated suspension upgrades and, more importantly, the model’s accidental mid-1960 transformation to pseudo sports car with the addition of hot-selling bucket-seat Monza models. 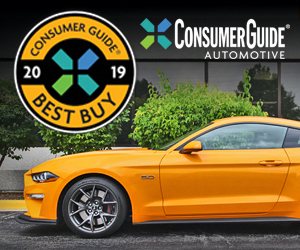 Ford, taking due note, promptly responded with the Mustang—but that’s another story. Written by: Chris Poole on September 2, 2012.on February 27, 2019.